Sendle currently doesn't supply any packaging. This allows you to take advantage of bulk buying packaging, so you can access the best rates. We recommend checking out your local office supply store or online. Like you, we want your parcel to arrive in perfect condition. Knocks and bumps are an expected part of delivery, so it's important you know how to best package your parcels. Below is a 5-step guide to perfect packaging. In a nutshell, we describe this as: well packed, arrive intact! Double box your products. Place one container inside another, with a cushioning material, such as scrunched up newspaper, in between the two. It might feel like overkill, but for fragile items, this is a must. Your packaging materials need to be tough and strong as you want a nice hard shell for your products to travel in. Fill empty space to keep things in place and prevent rattling. Silence is golden. Seal it shut with strong tape. Don't substitute secure packaging for 'fragile' or 'handle with care' stickers. Machines can't read these stickers, and so can't take extra care when sorting. Double-box your parcel. Place one container inside another, with a cushioning material, such as scrunched up newspaper, in between the two. Pad each item separately with bubble/foam wrap, tissue paper or newspaper. Pay special attention to the corners, edges and bits that stick out. Use strong rigid material larger than the object to minimise chances of crushing if it is a photo or drawing etc. Mark with appropriate labels (e.g. contains glass, this way up, contains liquids etc). For all domestic and international deliveries, we do not recommend sending parcels in Australia Post or DHL branded packaging. It can be confusing for our service provider who comes by to collect from you (and the workers at depots). Parcels with Australia Post or DHL branding will have to be returned to the sender because it’s been assumed they were mistakenly collected. Sometimes you really don’t have any other types of packaging available other than those mentioned above. Don't worry about it, we recommend to turn the Australia Post satchel inside out, which should help with hiding any logos. We are unable to transport any parcels packed in bubble wrap or plastic bags. Transparent or clear packaging is not allowed for international parcels. Any parcel wrapped in transparent packaging will not be collected. If your parcel contains liquids, is sharp, or could damage other parcels in any way then it is your responsibility to ensure that the packaging prevents damage to other parcels. Sendle does not offer compensation or insurance for damaged parcels. It is the responsibility of the sender to make sure the parcel is appropriately packaged. Want to become a labeling extraordinaire? Click here! 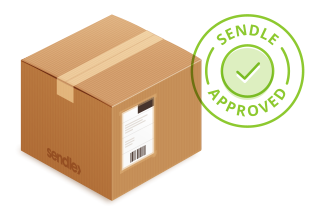 Now that you know how to wrap your package, you can create an order in your dashboard or sign up for Sendle and save a bunch on sending your parcels across Australia.